GW Women’s Leadership Conference tackles challenges of living in a global community and examines how inclusion could spur meaningful change. From civil war to uncivil political dialogue, an “us versus them” mentality is creating divisions around the world. With leaders from sectors including education, law and conflict prevention and management, the 19th annual Women's Leadership Conference at the George Washington University addressed the role of inclusion in bringing peace to divided societies. Held Friday on the Mount Vernon Campus, the conference featured a panel discussion moderated by GW trustee Cynthia Steele Vance, MVC ’79. Ms. Vance led panelists in a discussion of how education, activism and the inclusion of youth and women in policy discussions could create meaningful social change. “All of you have chosen a path of inclusion and a path of giving a voice to people who are often voiceless,” said Ms. Vance, who holds a Bachelor of Arts in communications from Mount Vernon College, which merged with GW in 1999. 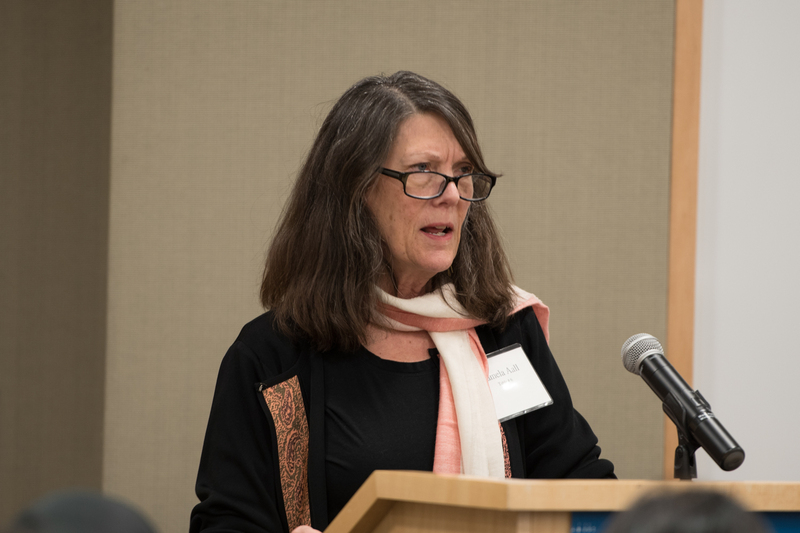 Mary Ellsberg, executive director and founding director of the Global Women’s Institute at GW, discussed her work addressing legal issues regarding domestic violence in post-revolutionary Nicaragua. After conducting research, she and her colleagues found that one out of two women surveyed had experienced domestic violence. “Just because people aren’t talking about it or because people’s voices are not being heard, that doesn’t mean that it’s not happening,” said Dr. Ellsberg. With their research bolstering the effort, legislation addressing domestic violence was passed in that country. Samah Mcgona Sisay, BA ’15, explained that opening access to power for underrepresented voices is critical. “Going to law school, I have focused on being able to advocate for others who aren’t able to do that for themselves. But I think that once you start working with individuals, what you realize is that it’s not that they don’t have a voice—they’ve been yelling about these issues forever -- they just don’t have access to those in power to bring about legal change,” said Ms. Sisay, who has been a student advocate in the Immigrant Rights Clinic at the New York University School of Law for two years. Ms. Sisay is a GW Elliott School graduate and was a member of the Women’s Leadership Program. Wendy Helgemo, founding director of the AT&T Center for Indigenous Politics and Policy, has more than 20 years of experience in federal Native American law, policy and working with tribal governments. She shared how her grandfather, a World War II veteran, and her mother, the first Native American woman to be ordained in the Evangelical Lutheran Church in America, inspired her career path and her commitment to service. “I’ve had some real trailblazers in my life who modeled education and leadership,” Ms. Helgemo said. Elizabeth Chacko, professor of geography at GW and associate dean for undergraduate studies in the Columbian College of Arts and Sciences, discussed how immigrant community-building has evolved in the D.C. area over the past few decades. Caroline Laguerre-Brown, GW’s vice provost for diversity, equity and community engagement, pointed to the university’s recent town hall, which addressed issues of inclusion on campus, as an example of the importance of student voices. Ms. Laguerre-Brown noted that the administration has formulated a set of action items to improve efforts to foster diversity and inclusion at GW, and that the work will be ongoing. Keynote speaker Pamela Aall, senior adviser for conflict prevention and management at the U.S. Institute of Peace, explained how conflict management and peace-building experts in some of the world’s most contentious areas have been working to bring women, youth and minority populations to the table in an attempt to create more inclusive leadership after a civil war or violent conflict. During the luncheon, Nina Mikhalevsky, provost and professor of philosophy at the University of Mary Washington, paid tribute to Ms. Somers, who played an important role in promoting women’s education, civic activism and community engagement. Previously, Dr. Mikhalevsky served as the director of the Elizabeth Somers Center and Women’s Leadership Program at GW. Alumnae recognition also was given to Joanne Holbrook Patton, MVS ’48, and Harjinder Gill, MVC ’99, during the luncheon. Special guests included Anne LeBlanc, wife of GW President Thomas LeBlanc, and GW trustee Judith Lane Rogers, MVC ’74. GW Trustee Cynthia Steele Vance and GSPM Director Lara Brown say a combination of factors have led to a lack of public discourse in national politics.